A couple months ago Gordon Mott of Cigar Aficionado penned a blog post about the misleading use of cigar ratings in advertising. This was prompted by one manufacturer in particular who cited a 93 rating to promote a cigarillo line. 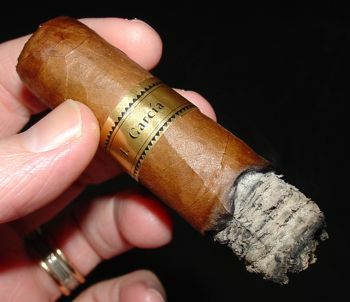 The problem is that the rating was for a toro-sized cigar made by the same company 20 years ago. Unfair? Misleading? Of course it is. But if anyone should know something about smoke and mirrors, it’s a cigar aficionado. Even if the advertising were for the same cigar, the use of that rating would still be questionable. Only the largest cigar companies are able to maintain the huge libraries of tobacco necessary to create the same blends, year after year. In many cases this just isn’t possible, especially with smaller boutique brands. Take one of the great cigar success stories as an example. Ten years ago, Jose “Don Pepin” Garcia was virtually unknown outside the circles of cigar geeks who read blogs like this. El Rey de Los Habanos was just one of the many small shops that populated Miami’s Calle Ocho neighborhood, but they were making cigars like none other, and consumers quickly caught on. The Miami operation couldn’t keep up with demand, and after a change in name and a move to Esteli, Nicaragua, My Father Cigars now operates a huge facility that rivals that of many long established cigar companies. While they still make stellar cigars (some better than others) I would hesitate to call My Father “boutique” at this point in time. They are not the same company they were ten years ago, and they aren’t using the same tobacco. And yet… the Don Pepin brand name remains the same, and some fans of the brand still think of it as a boutique label. So the question is this: when I pick up a DPG Blue Label in my local cigar shop and think about that potent blast of black pepper and the cocoa and the caramel of that brilliant Nicaraguan Corojo — am I living in the past? I thought I might try a little experiment to test that hypothesis. Digging into the deepest recesses of my dwindling supply of aging cigars, I found DPG Blue Labels from three different years. 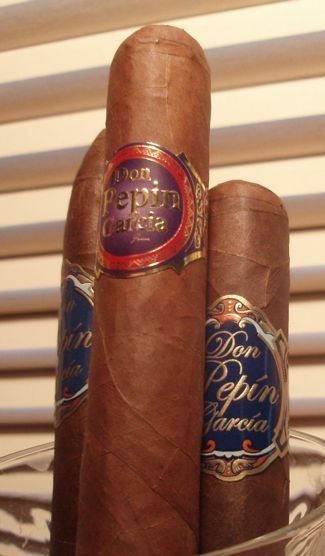 Unfortunately they were not all the same size, but at least they represent the DPG Blue over a significant period of time: a robusto from 2006, a torpedo from 2009, and another robusto of recent vintage. All three cigars received the same treatment and were smoked under the same torrid desert conditions. There are some minor differences in appearance, but all three are well made cigars. Both the 2006 and 2013 robustos have wrappers that are fairly dry and leathery in appearance, in contrast to the torpedo, which is noticeably more oily and smooth. All three are a little bit bumpy, but solid, and they all exhibit a firm but productive draw. What I remember most about the DPG Blue is its explosive introduction. Ask anyone who smoked the big-bore Pepins back in the day, and you’ll probably hear the same thing. I expected the 2006 robusto to have mellowed, and my expectation was borne out. What I didn’t expect was that the 2013 blend would be almost as mellow as the 2006. Either the blend has been tamed by its designers, or my palate really rose to the challenge when I smoked the ’13. Assuming the former, it seems that the power of the Blue Label blend has waned in recent years. The oldest of the group, the 2006 robusto, turned out to be a disappointment. The opening was mildly spicy, but the palate flavors were papery and flat. The mid-section brought some cocoa and pepper finally showed up in the last third. A complex aroma of leather and caramel saved the cigar, though it could never quite overcome the tannic and dry qualities that appeared on the palate. I was expecting more from this elder statesman, but apparently its glory days have passed. The 2009 torpedo was the most complex of the three: leather, cedar, and roasted nuts with increasing earthiness on the palate as the cigar progressed. In the mid-section there are caramel notes and a rich potent aroma. The cigar ends with a pretty good nicotine thump, even after four years in the box. There is a dash of pepper before the inevitable char at the finish line. The newest exemplar of the blend, the 2013 robusto, was surprisingly smooth. I expected a major recoil from this Nicaraguan cannon, but I was pleasantly surprised. I’ve never been a fan of overwhelming spice, but I would expect that smokers who pick up a DPG Blue are looking for that very thing, and I have to wonder if by now they’ve moved on to other blends. The smoke is medium in body and flavorful, but not wildly complex either. Some cocoa and cedar with a touch of sweetness round out the palate flavors, which get a little more concentrated as the cigar burns to its conclusion. 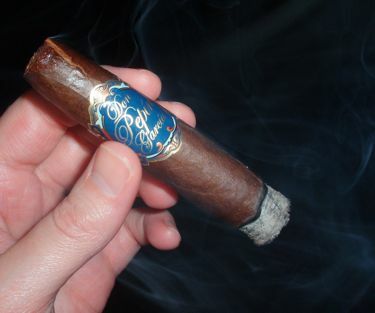 Even strong cigars lose their potency over time, but I was still surprised at how much the 2006 DPG Blue had faded. This used to be one of the heaviest sluggers around, but time has mellowed the old blend to a shadow of its former self. In the intervening years the cigar appears to have been reblended and refined, and while I wouldn’t call the 2013 blend a shadow exactly, it’s certainly not as substantial as the 2006 was when it was fresh. In between these two was the 2009 torpedo — the best of the bunch, and the closest to what I remember the original blend tasting like. All of which is merely to point out what is fairly obvious to serious cigar connoisseurs — cigars in storage change with age, and blends change over time as manufacturers tinker with them or use other tobaccos out of necessity. 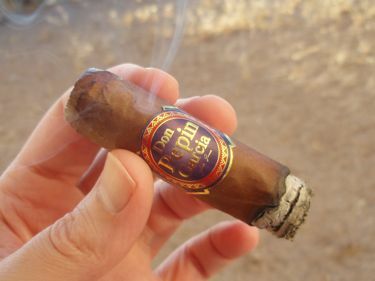 The DPG Blue simply tastes different today than it did in 2006, and using a rating from years ago to describe a cigar made today is highly questionable at best. Over the years I have really questioned whether aging a cigar is always worth the effort. I’ve made a committed attempt, but so far I haven’t found it to be uniformly successful. Obviously there are many dedicated proponents of cigar aging, but I was heartened to read that Jose “Don Pepín” Garcia is not one of them. A few years ago he was at an event and a participant asked him if aged cigars were better than freshly rolled sticks. “A ten year old cigar, you might as well smoke paper.” Garcia said that cigars are meant to be enjoyed while the oils and moisture are still present — and it makes sense as a cigar maker that he would say this. He’s blending cigars to be smoked with the qualities that the tobacco has now, not what it will have years from now. So it is a little ironic that of all the cigars I’ve aged, this one has performed the best over time — Garcia’s Nacionales W El Mundo. 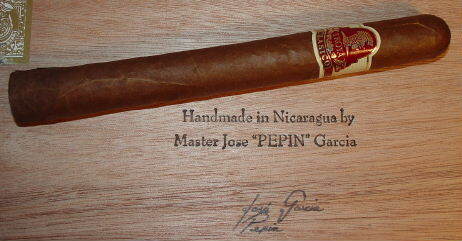 I picked up a handful of these in 2006 at the Cigar King in Scottsdale, Arizona, for which the Nacionales is made. I smoked most of them then (you can see the original review here), but this one has been resting quietly in my long-term humidor ever since. The cellophane has taken on a yellowish-brown hue, but aside from that the cigar still looks perfect. The El Mundo is a 5.5 x 52 robusto with a triple-wound pig-tail cap that makes it look like a Cabaiguan Guapo. The wrapper is a Nicaraguan Corojo 99, and if any of the oils have volatilized over the years it’s not easy to see — the leaf is supple and displays a nice sheen. The roll is solid, and the draw is as perfect as you can get. I was surprised to find that the prelight scent of the tobacco is still pungent with earth and musk. It often takes a few minutes for an aged cigar to awaken after its long slumber in the humidor, but the Nacionales W perked up right away with a dry woody flavor and a dash of black pepper on the tongue. 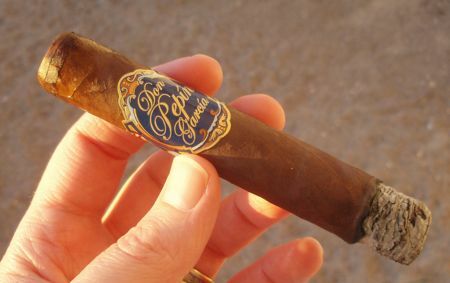 The flavors of this cigar suddenly came back to me — dry tannins, woody spice, and a sweet semi-floral note on the nose. The aroma is complex, exhibiting everything from cocoa to sandalwood. At the mid-point this cigar is wonderfully expressive, and I think it probably has improved over time. The tannins have dropped off a bit but the pepper lingers on the palate. There is a bready note that I rarely notice in non-Cuban cigars. The body is in the medium range, and even after five years the nicotine kick is still considerable. The last third of the cigar is earthy with coffee and cocoa-like overtones. The finish is lengthy and the aftertaste somewhat bitter at the very end. After five years, the Nacionales W shows none of the evanescence that the blender fears — this is a solid smoke that is every bit as complex and enjoyable as it was on its release, if not more so. My only complaint is that I don’t have more of these on ice. With the tremendous surge in Don Pepín’s production it doesn’t seem likely that the blend is exactly the same today, though there’s always hope. But at least the Nacionales W is still available, presumably in a formulation that is at least close to the one here. This blend is available only from Cigar King, and the El Mundo size sells for around 6 USD each. I’ll be tempted to pick up a few more the next time I swing through the Phoenix area. This is one of the last of a box of Saint Luis Rey Cazadores that I bought in late 2005 to conduct an aging experiment. Soon after this the Cazadores vitola went out of production. The manufacturer toned down the blend for the other sizes in the line, but this is the original Honduran blend. After reading so much about how well Cuban cigars age, I wanted to see how a full-bodied Non-Cuban cigar would hold up over a few years. After acquiring some aged Camacho Havanas that had become extremely mild over the years I wanted to compare different styles of non-Cuban cigars after a few years of aging. When I first cracked the box I found the Cazadores to be aggressive, but tasty — woody and spicy with a peppery bite. Two years in long-term parking mellowed the smoke significantly, allowing more distinct flavors of leather and cinnamon to emerge, while still retaining some of the original bite. It has now been almost five years since I purchased this box, most likely more than five years since they were produced, so it’s time to give them a final assessment. The St. Luis Rey Cazadore has not suffered at all from its long cedar nap. The wrapper is just as pretty as it was on opening the box in 2005, and the roll is solid with just a bit of give. One improvement made over time is the burn — these senior smokes are burning righteously, though the ash is still a mite flakey. The first few puffs on the Cazadore are reminiscent of the young cigar — a touch of spice on the tongue — but this sensation quickly dissipates and is replaced by a smooth, almost creamy smoke. The smoke texture is still full in body and has a decent kick, but this feisty Honduran of 2005 has finally matured into a respectable citizen of the world. 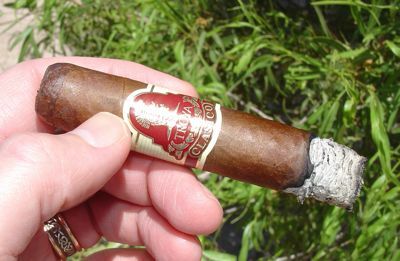 When new this cigar’s aroma was almost undetectable amidst the hammering that it gave the palate, but five years later it reveals an enjoyable and subtle spice over an earthy foundation. The mid-section of the cigar is still hearty, but its spirit has waned over the years. More than anything I enjoy the cedar and light spice on the nose — cinnamon or nutmeg I think — and the smooth earthy flavor. The final section gets a little more serious as the black pepper kicks in again, but the flavor loses complexity and eventually flatlines. I think these cigars are probably a little past their peak at this point. The flavor isn’t completely washed away yet (as happened with the Camacho Havana after six years) but the complexity of the cigar is waning. The toasty, earthy flavor of this 5 year-old blend is still very enjoyable though, and the soft subtle spices that have emerged in the aroma are a nice surprise. Aging this now -extinct SLR blend has produced a pronounced change in flavor as well as performance, and each stage of its maturation has revealed a different set of characteristics. That’s what makes aging cigars fun. Leave a comment if you have any suggestions for other blends — especially Non-Cuban cigars — that you think age really well. One of the exciting things about being a cigar smoker is that there’s always something new on the shelf, and cigar makers take full advantage of our excitable nature. It doesn’t matter to me if a cigar has been hailed as the Second Coming or panned like a Uwe Boll movie — if Pepin Garcia made it, I’m buying it. At least once. But this phenomenon is not without its drawbacks. There is a commercial law of conservation at work here that says for every new blend that hits the shelves, an older one must go. Shop keepers struggle to find shelf space, and consumers have only so much money in their wallets. At the end of the day it’s a popularity contest. The winners are restocked and the losers go to the discount warehouses. It’s disappointing to see the sun set on a great blend, but Pepin Garcia’s Troya Clasico is about to disappear into the glare. 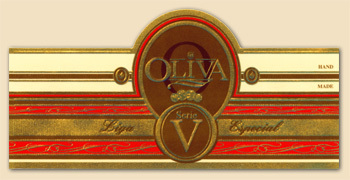 The company that distributed the blend was acquired by Britain’s Imperial Tobacco, which acquired Altadis, which is why there are still Troya brands in circulation — but they’re not Pepin’s blend. The newest Troya is the Clasico Limited Edition, blended by the late great Frank Llaneza. It’s probably a good smoke, but it’s not the same cigar. It looks like the remaining Pepin Clasicos were picked up by one of the usual suspects (JR Cigar) and have been on the chopping block for a few months now. Late last year I picked up a couple boxes of the churchills at a cut rate price, and I may have to double up on that soon, before they’re gone forever. But before I wash away in a tide of nostalgia I thought I should muster up an aging report on this great cigar. I broke a few of these out of long-term storage to see what three years has done for them. The wrapper on this cigar is not quite as supple as it used to be, but I’d put that down to less than optimal storage conditions. My vinotemp does a pretty good job, but it’s not a locker at Alfred Dunhill. The roll is solid and it clips cleanly. The draw is perfect, the burn is straight, and the ash is built like a dowel rod. My only complaint, if I have to have one, is that it burns a little quickly. But even at the band it doesn’t get hot. After three years this cigar retains most of its identifying characteristics — primarily wood with a sweet, beany aroma, something like caramel and coffee. The Troya Clasico hasn’t undergone any radical transformations, but the bitterness is completely gone. Fresh Pepin blends almost always have a tannic edge to them, and although this cigar wasn’t over the top in that regard, it was still a touch bitter. The years have taken that edge off completely. In the second and last thirds the flavor turns to leather, but the sweetness and mild-mannered nature of the cigar continues on. It’s smooth as butter, about medium in body, and easy on the nicotine. The flavor starts to muddy at the band, but that is after 60 minutes of pure pleasure. My opinion of the Troya Clasico hasn’t really changed too much — I picked it as the second best cigar of 2007, and I don’t regret that ranking. For me, a new Pepin Garcia blend is like a new Francis Ford Coppola movie. I don’t always like the movie, but my respect for his talent dictates that I will get in line on opening night and watch whatever it is that he’s decided to do. I feel the same way about Pepin. A lot of what he blends is too strong for my taste, but for me the Troya Clasico hits all the right notes, and it doesn’t play them too loud. It’s one of the nicer cigars I’ve smoked this year, and it’s sad to see it go. I have been aging cigars for a few years now and have come to the tentative conclusion that aging does not immeasurably enhance the quality of most non-Cuban cigars. Despite this I still have a few boxes put away for testing and comparison purposes. I have all but given up on aging mild to medium-bodied cigars because the effects of aging seem to be a gradual diminishing of flavor. On the other hand, medium to full bodied cigars are able to withstand and possibly benefit from this moderation, especially when the cigar is a little too aggressive in its fresh state. The Cubao No. 5 falls into this latter category: a medium-bodied smoke with a few rough edges that might smooth out with some age. After about a year in storage, it’s time to break them out and file a progress report. This toro starts up with that trademark Pepin pepper, but it’s not as powerful as a lot of his heavier blends. … After an inch I’m tasting cocoa and coffee with cream types of flavors, and the aroma from the foot is quite nice. …the way the sweet wood on the nose melds with the spiced cocoa on the palate. There isn’t a lot of transition in the second half of the cigar, but I’m noticing a dry finish and a little scratch on the throat. Nothing a cold pale ale can’t take of. The intensity doesn’t pick up too much until I hit the band where the pepper ratchets up a bit. The flavor remains sweetly woody up front with cocoa notes in the margin. The pepper stays in the background and in the aftertaste, which is otherwise pretty clean. Cubao cigars are brought to you by Espinosa y Ortega, makers of 601 and Mi Barrio cigars. They are manufactured by the Garcia family’s Tabacalera Cubana in Esteli, Nicaragua, with Nicaraguan filler and binder leaves and topped off with a dark Ecuadorian Sumatra wrapper. Six sizes are available. At 6 1/8 x 50, the No. 5 is their toro entry. A year in the coolerador hasn’t done much for these cigars’ complexion, but of course that wasn’t expected to improve. The Cubao No. 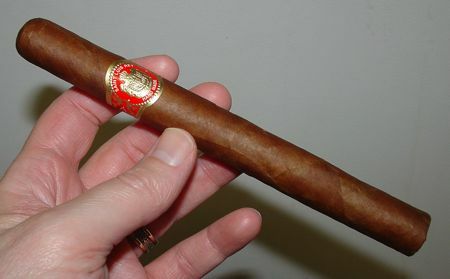 5 is a masculine looking cigar — the wrapper is rough and mottled dark brown to almost black in places. The roll is a little soft, but that may be due to storage. Storage conditions were 60-65% relative humidity, and judging by the loose draw they might do better with a little higher RH. Despite this the stick burned perfectly and never got hot, so no points were lost on that count. I’m not sure why, but it always seems like aged cigars take a minute or two to wake up. The first few puffs of the Cubao are straightforward tobacco, nothing too interesting, but certainly not unpleasant either. After a minute the flavor gets grainier, like cereal with some natural sweetness and a dash of pepper. The aroma from the smoldering wrapper carries the most interest here — it’s leathery, with a muskiness to it that is very nice. A small scratch at the back of the throat is the only real negative here, but it is not as severe as it was in its bolder, fresh state. A year is not a long time in terms of serious cigar aging, but the effects are still apparent with the Cubao No. 5. In a year’s time these cigars have mellowed a little bit and are starting to show increased complexity. This is a very good cigar to start with, so it’s basically a matter of comparing subtleties. I detected a wider range of different flavors in the aged stock, including some things I didn’t pick up a year ago — notes of leather and musk, and more flavors in the transition after the mid-point. Combined with a slightly less aggressive attack on the back palate, I’m going to say the Cubao is a very good candidate for aging. For now I will have to retract my conclusion about aging non-Cuban cigars — and revisit these in another year, if I can resist them that long.